In a previous post I listed the top 5 tools and techniques necessary to successfully piece your first quilt top. One of those items listed was an Olfa Rotating Cutting Mat. In that post I briefly described it’s use but after reading a few other reviews I discovered this particular mat received mixed reviews. My intent here is to provide additional information to help prospective buyers decide whether or not this product is right for them. The basic design is, in my opinion, genius. Rotating the cutting mat versus moving the fabric to be cut significantly increases the accuracy of those cut pieces of fabric. And, we all know accuracy is the key to a perfect or a near perfectly pieced quilt top. My own quilting and sewing space is very small and much of my furniture has to do double duty. The size of this mat fits perfectly on my small cutting table (which was originally a folding TV table). It’s size – just over 12” square makes it easy to move from room to room and stores easily for travel to quilt retreats and festivals. 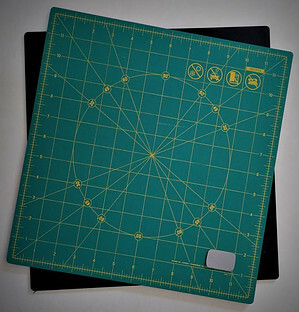 In addition to its specialty feature, the overall design and size enables this mat to serve as a general-purpose mat for cutting, trimming and squaring up square, rectangle and triangle shapes. Most of my quilt projects incorporate a half- triangle square of half-square triangle in to block or a block design that is a 10” square or less. Being able to place my fabric on the rotating mat – using the grid lines for accuracy, make a cut, rotate, cut, etc., until all four sides are trimmed is also a significant time saver. There are however, a couple of aspects of this product I’d like to see improved. Number 1 – the Odor. I have other cutting mats from Olfa as well as other brands and nothing has the odor of this mat. I’ve taken it outside foe several hours, put it out in the garage, the basement – the odor persisted. I removed the rotating bottom and covered the entire board in baking soda even soaked it in a warm water and baking soda mixture. Still, no change. The upside: through all this abuse the cutting board never lost any of its other properties – it’s definitely colorfast and retains its shape, texture and self-healing properties – no matter what you do it. I’m sure there are limitations and extreme situations that would test this mat’s durability for normal day-to-day use this mat will provide a reliable cutting surface for years to come. 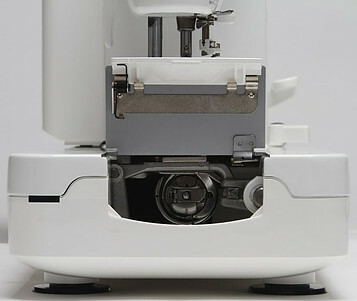 Number 2 – the Rotating Base. While it is this aspect that makes this board so indispensable the ease and smoothness of rotation needs to be improved. Often when I try to turn the board it will stick to the base and I have use one hand to hold the base while turning the board with the other. A flaw that is probably inherent in the design however, when this does happen it sometimes causes the fabric to move or shift slightly, defeating the sole purpose of using this over a stationary cutting mat. 1. I still can’t live without my Olfa 12″ rotating cutting mat. 2. The odor has finally dissipated. I would say it took well over 2 years – however, after 1 year I was able to bring and keep it inside the house in my sewing room and no longer had to store it in the basement or garage. 3. I’ve learned to live with the occasional stickiness of the rotating base that can be alleviated with a little baby powder (which by the way slightly helps to improve the scent). 4. The list of “Pros” far outweigh the “Cons” therefore, I’m giving this a rating of 4/5. Had the odor not been an issue I would have given it another 1/2 star. I’d love to hear your opinion! Tell me about your experience with the Olfa 12″ Rotating Rotary Mat. Feel free to pass along a useful tip or just share your thoughts on the use of this or any other rotating cutting mat you currently use or have used in the past ! 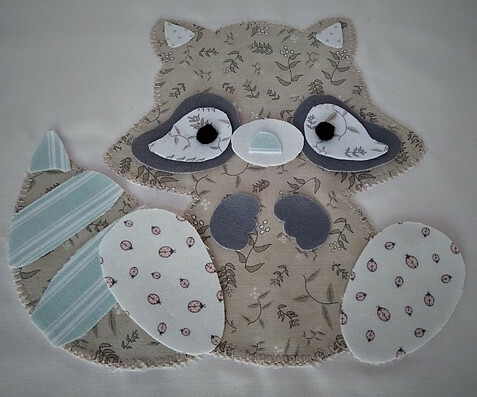 Over the past couple years I’ve read many tutorials and watched several videos each describing the various techniques for creating a pattern to be attached – or appliqued – onto fabric. For every technique available, there are an equal number of associated pros and cons. For this quilt I’m taking from a variety of different techniques and I am curious to see how well this technique works out in the long run. Most people like to use double-sided fusible webbing or interfacing to reinforce the individual applique pieces. It makes perfectly good sense as this inner layer (the webbing or interfacing) will be sandwiched between the background fabric of the quilt underneath and the fabric applique on top. 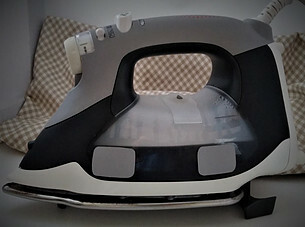 “Double-sided” implies doing four tasks in two steps however, my experience with this type of interfacing is one of added steps and added time and added frustration. Certainly there are instances where this product is preferred but I didn’t feel this particular project was one of them. Double-sided or other more densely woven interfacing are great when you not only need to reinforce appliqued fabric but when it is more desirable to have substantial stiffness or structure – like on a tote bag or garment. stiff. With this type of quilt I wanted to make sure the appliqued blocks would fold and drape as easily as the surrounding pieced-only blocks. products out there, but the linen texture is heavenly to work with. Step 1 – The Pattern. Purchase and download the pattern Woodland Critters from Avery Lane. 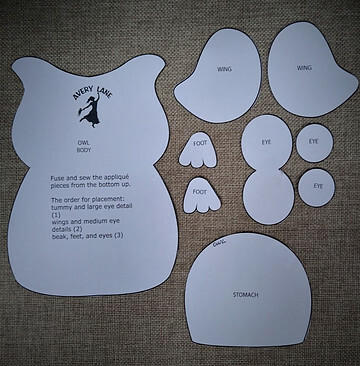 Once downloaded, print off the templates for each critter and then cut out all the shapes. 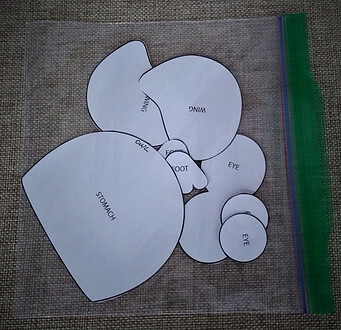 To keep things organized I put every shape for each critter into a zip lock bag. A couple of the animals have many small parts that are very easy to lose. Step 2 – Decisions, Decisions. Alternatively, use a fabric where all top stitching can be done with one color or maybe only two different colors. I suppose it is possible to use clear thread. I personally have no experience with clear thread – I may get wild and adventurous one day and give it a try. When I do I’ll let you know how it works out! The description for this next step is somewhat wordy but I’m including photos to help clarify any confusion. 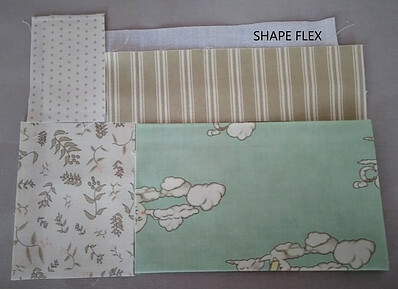 Because I choose to use Shape Flex interfacing my technique may appear complicated but once you go through the process you’ll find it is quite simple and doesn’t require a lot of time-consuming measuring and attention to detail. Step 3 – Fusing the Fabric to the Interfacing. Once you have decided what fabric to use for each critter as well as the other shapes it’s time to fuse the Shape Flex to the fabric. 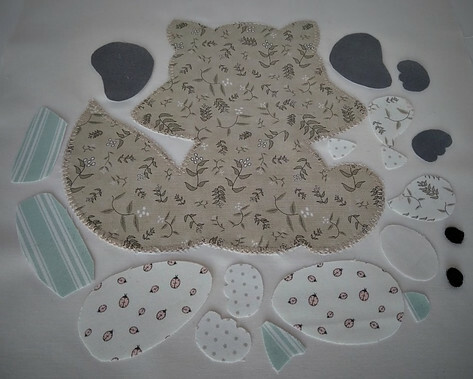 No exact measurements need to be done here but to prevent wasting too much fabric or interfacing, you will simply cut out a piece of fabric slightly larger than the finished size of each applique piece. 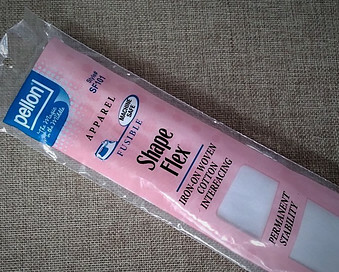 Unroll a length of Shape Flex interfacing large enough to cover several pieces of fabric. Lay the wrong side of the fabric on to the sticky side of the interfacing making sure each of the fabric pieces touches one another and there are no spaces in between. This prevents having any areas of interfacing from being exposed and from sticking to your iron as you fuse the fabric to the interfacing. For extra measure you may want to extend the fabric about 1/4″ beyond the edge of the interfacing. In the image below I’ve tried to illustrate how the individual fabric pieces are positioned on top of the interfacing and how the dotted and striped fabric pieces extend a bit beyond the edge of the interfacing. What you end up with is one large piece of fabric with an attached interfacing. Treat this as you would any other single cut piece of fabric. 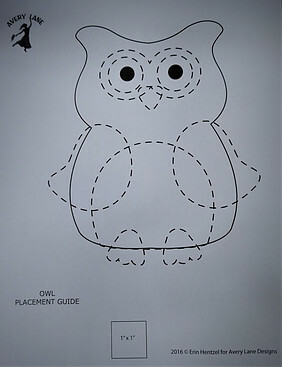 Step 4 – Tracing and Cutting. Place the paper template on the fabric and trace around. This doesn’t have to be perfect nor does it really matter if you trace on the right or wrong side because once you have everything traced you’ll move on to cutting out all the shapes. Again, perfection is not required as these edges will eventually be stitched over and completely hidden. Step 5 – Finding the Middle. Starting with the large animal piece or base, turn over to the wrong side, locate the center and place a small pencil dash or dot. Locate the center of the 10” square of background fabric and place another dash or dot. 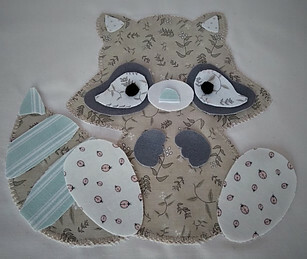 You can then use a straight pin to match up the marks to help get the base applique centered on the 10″ fabric square. Lift up one side of the applique and using a glue stick lightly glue the applique to the back. If I want to be exact with the center placement I will use my ironing board as a surface to work on as I have no worries piercing a straight pin into the ironing board cover. For smaller projects I have an 8″ cork board that works very well. Sometimes “eye balling” the center placement does just as well and using a clear school glue stick allows you to re position as many times as you need to get the base of the design exactly where you want it. 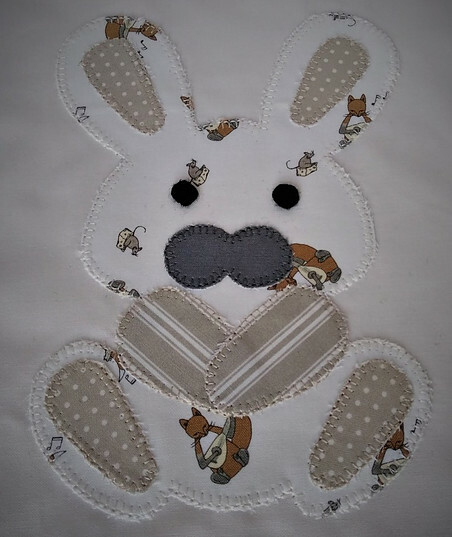 This will securely baste the animal shape to the background fabric allowing you to sew or top stitch around the shape without shifting or having to use pins to keep it in place. Returning to the quilt pattern instructions, layer the remaining pieces as instructed until all pieces are used and the result is a completed “Critter” appliqued onto the 10” square of fabric. Repeat this same process for the remaining five “Critters”. Stay tuned for the next post where we begin to piece the different rows alternating a four-patch block with the appliqued square. 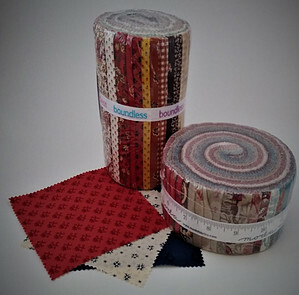 If you are like me when the quilting/sewing/I-have-to-make-something bug hits it usually happens when I’ve eyed a stunning quilt or located a new fabric line, my first thoughts – “I need to make that” or “I have to make something with that fabric”. Like many worthwhile things in life, quilting is not always so quick and easy. Even patterns and kits labeled as “Quick” and/ or “Easy” omit the preparatory steps that make the difference between finishing that quilt top or turning that pile of fabric into another UFO (UnFinished Object). The goals here is to show you, step by step, the 5 basic techniques, when followed, will eliminate mistakes, do-overs, wasted time and money. There may be a bit of time expenditure in the beginning but in the long run, these techniques will allow you to successfully begin and complete every quilt top you attempt. one. (If some reason you purchase this and find you never use it contact me and I’ll be happy to buy if from you!). 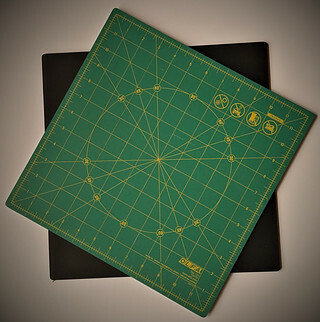 The second mat is a smaller 17” rotating cutting mat. 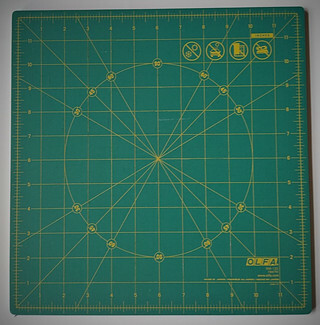 I have found I use this A LOT especially when piecing half-square triangles and squaring any block 10” and under. Once you start using it you will want to use it every time you make a cut! time!). For the sewing machine, I have found the ¼” presser foot something I cannot live without. When it comes to thread – so many types and colors but start with a good 100% cotton 50 wt. thread in a neutral color (white, light and/or medium gray and black). 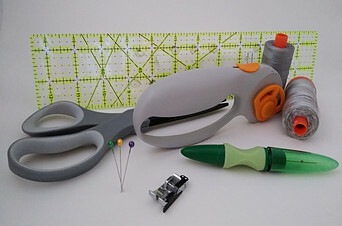 When you have the right tools – large enough cutting mat, rotary cutter and ruler – this is easier than you think. However, cutting with these tools is much different than cutting with a pair of scissors. My suggestion would be, before using the fabric you have chosen to piece your quilt top, practice making accurate cuts with scrap fabric – old bed sheets or pillow cases work very well. Begin by taking a piece of fabric approximately 12” square and laying it on the large cutting mat. Then using your rotary cutter and ruler practice cutting 10” squares. This is a good time to try out the rotary mat. 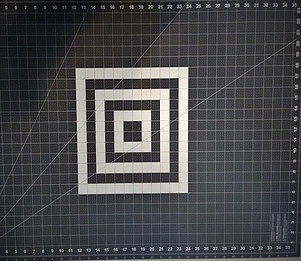 Place a 10” squares on the mat and using your ruler, cut this square into (4) 5” squares. You will be making one cut right down the middle then without moving the fabric, turn the mat instead and make another cut down the middle. Next, using the same technique (cut, rotate, cut, rotate), cut the 5” squares into (4) 2 ½” squares. After making the above cuts it will seem obvious what a time saver it is to use pre-cut fabric however, there are a couple of down-sides. The first being the fabric design itself. You may have a wonderful quilt pattern that uses 2 ½” fabric strips but the fabric you want to use is not available in this cut. So, what you do is make a couple of decisions. Is your time more valuable than the design you want to create? If so, are you willing to compromise and choose a fabric in the precut size you need? At this stage consistency and accuracy go hand in hand. You ‘ve measured twice, cut once and have arranged the pieces to be sewn together. THE thing that will ensure your pieces line up correctly is sew each seam the same width. Typically, a seam is ¼” from the edge – the reason for using a ¼” presser foot. It has a little “fence” along the right edge. When you keep the edge of your fabric against this “fence” the entire length of every seam will be the same. For some reason, these plates (at least on the machines I’m familiar with) do not have a ¼” marking and I have found I cannot sew an accurate seam without one! 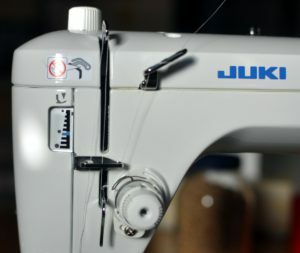 There is nothing wrong with sewing a 3/8” or even a ½” seam allowance and if you choose to do so, most sewing machines have a mark on the needle throat plate that you can use as a guide. What is important, that whatever seam width you choose you use that same width for the entire quilt top. – Iron Seams to the Dark Side or Open? I realize what I’m about to say could lead to an open invitation from the “quilt police”! Pressing your seams before moving on to each subsequent step is almost as important as the sewing itself and no one is going to challenge me on that however, when it comes to “how” to press those seams there are differing opinions. In the past, it was necessary to press both pieces of fabric to one side – typically to the “dark” side. This served two purposes: 1) the darker fabric was used to help hide the fabric at the seam and 2) closed the seam to prevent the inner layer of batting from working its way through the seam. 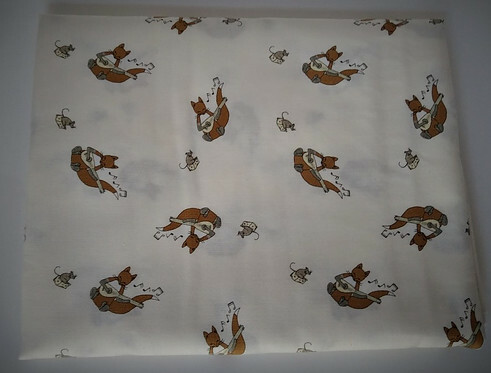 Today, the batting that is used is somewhat denser and of higher quality and our quilting techniques have improved – most of which is done my machine. 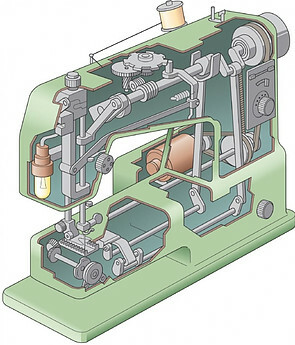 As result, out seam pressing techniques can also be modified a bit. I like to press all my seams open – yes, I said it…ALL seams open and here is why. Many quilt patterns that incorporate a variety of shapes and sizes – points in particular – are so much easier to work with when the seams are open. Closed seams create a huge amount of bulk at the points where the pieced points meet. Sometimes there so much bulk it is hard to get a machine needle through it and if you do, when it’s time to press, the seams will not always lay flat. This unsightly bulk never goes away. It’s still there when it’s time to quilt and still there after the quilt is bound and finished. Since this article is about piecing strategies for instant success – getting things right the first time – I’m sticking to my guns and suggest, at least for now, you press all seams open. When time allows and you are feeling adventurous, try pressing all your seams to one side (or the dark side) and see what you think. There are certain quilt top patterns where you may find it best to use both techniques! If anyone has other – better – tips and techniques feel free to share in the comments below!